Makerspaces are all the rage these days. Do you know anything about them? According to Wikipedia, a makerspace is defined as “a hacklab, fablab or creative space in a location where people with common interests, often in computers, technology, science, or digital or electronic art (but also in many other realms) can meet, socialise and/or collaborate.” Makerspaces have popped up all over the country and have sparked a “Maker Movement”. Educators have been inspired to create unique makerspaces for children and these days it’s not unusual to find makerspaces in schools, libraries, and community centers. 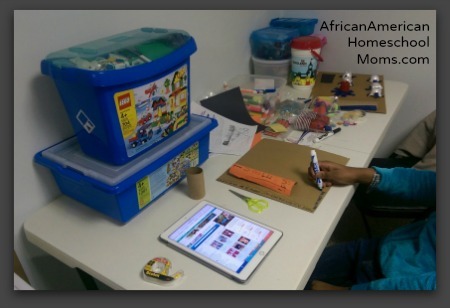 Now, homeschool parents are creating makerspaces in their homes. Each of these makerspaces is equipped with the tools and supplies children can use to help them flex their mental muscles and concoct a variety of neat hands on projects. After I hearing about makerspaces while my daughter was taking a robotics class at our local library, I decided to search the internet to learn more about them. I discovered gorgeous pictures of elaborate makerspaces where children were happily creating neat things using a vast array of everyday items like buttons, cans, bottle caps, etc alongside amazing tools like jigsaws and LED kits. 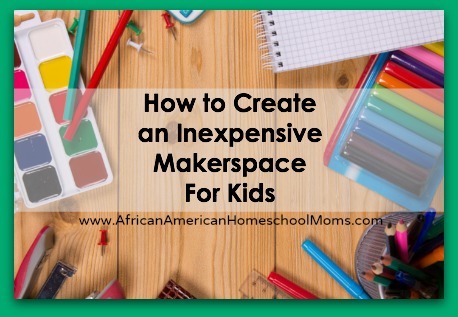 I assumed creating a makerspace was an expensive endeavor and since I wasn’t working with a large homeschool budget, I decided our homeschool didn’t really need a makerspace. 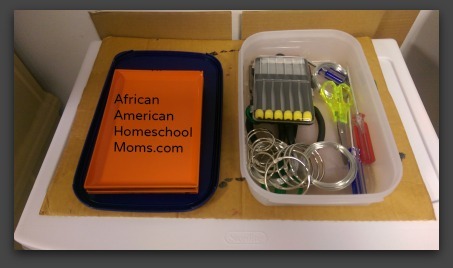 But over in the African-American Homeschool Moms Facebook group, I began to see homeschoolers eagerly chatting about how their children loved to create things. These Makerspaces, Maker Labs, and Tinker Tables were helping children exercise their natural creativity and helping them become self starters. After reading one mom’s posts about the benefits of creating makerspaces and seeing photos of her children engaging in fun activities with basic household supplies, I decided to create a makerspace on my limited budget. I am happy I did, and my children are even happier! Creating our makerspace, which we refer to as The Maker Station, wasn’t hard at all and didn’t cost very much money. For around $25, I was able to purchase everything I needed to set up a fun makerspace for my children. Once the supplies were assembled, my kids got to work creating all kinds of neat things. 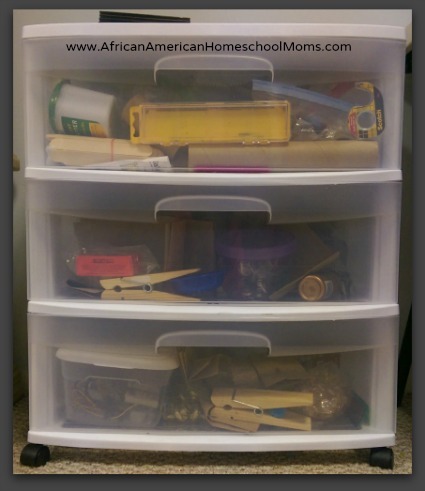 You can store your supplies in any container, but I wanted something large, easy accessible, and well organized. Our things are stored in a Sterilite rolling cart I purchased from Walmart. The three long drawers are large enough to hold all of our Maker Station supplies. 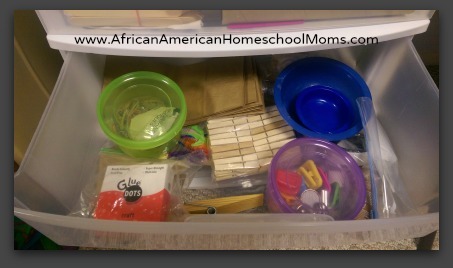 The green and purple containers inside the drawer were purchased at Dollar Tree. The Maker Station sits right beside the Lego table, so once my kids pull out their supplies they have ample space in which to work. When you choose the workspace, don’t choose an area and/or work surface you want to keep super clean. Making can be messy, so choose the location wisely. Consider covering tables with tablecloths or have your children work on top of large pieces of cardboard. That way if spills or stains occur, you won’t be upset. Though you can go out and purchase things for your makerspace, I recommend you poke around the house for supplies first. My children found lots of great materials just by rummaging around in our drawers and closets. Also, before you toss something into the trash, consider if it would make a good addition to your makerspace! If you do find you need to purchase things, check thrift stores and one dollar stores. 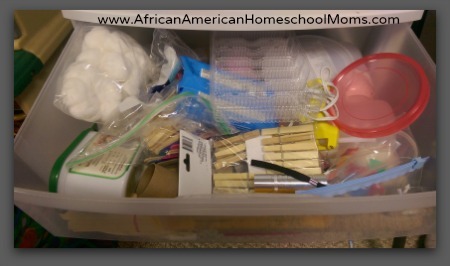 Here are the things on our supply list: pipecleaners, oatmeal containers, shoeboxes, dowels, plastic bread tabs, wheels, yarn, string, cotton balls, popsicle sticks, scissors, fabric, cardboard, nuts, bolts, screws, clothespins, twist ties, screwdrivers, egg cartons, hammers, nails, hot glue gun and glue sticks, magnets, pliers, cereal boxes, tweezers, lids, string, wire, trays, bottle caps, soda can tabs, wire cutters, masking tape, buttons, painters tape, cans, paper clips, game pawns, spools, medicine cups, keys, and flashlights. Children are certainly able to come up with ideas on their own, but if they need a bit of inspiration, you’ll find 20 great ideas when you download my free Makerspace Task Sheet. You can also check the following websites for additional activities. A makerspace is a great way for children to express themselves creatively and a wonderful way for them to learn through trial and error. Since there are no rules for making, children often wander down many creative avenues as they design amazing things. 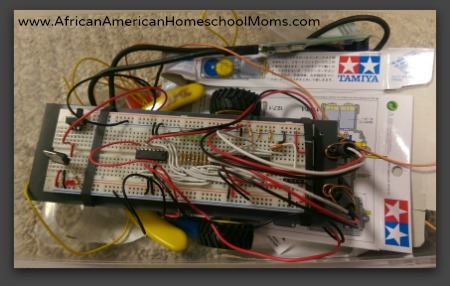 Your at home makerspace doesn’t have to cost a lot of money in order to be fun and effective. Gather some things today. Your children will thank you for it!